When it was originally released in August 2012, Murder of Crows sold out quickly. Far too many homicide enthusiasts returned to their local precincts empty-handed. But now, Atlas Games is happy to announce the return to availability of Thomas Denmark and Eduardo Baraf’s vicious little card game where you assemble the elements of a murder most fowl. In Murder of Crows, players uncover stories of devious characters and their fatal schemes. Each card features a story element and one of the letters necessary to spell out “M-U-R-D-E-R.” Each player assembles her own “MURDER” while working to undo her opponents’ work. Each letter has a special ability a player can invoke when playing a card of that type. For example, playing an “M” allows a player to Misplace an opponent’s card, taking it from his MURDER-in-progress. Playing an “E” forces other players to Expel their entire hands, drawing three replacements. And so on — you can read the complete rules online. The first player to spell “MURDER” wins the game. As a narrative bonus, phrases on the six cards that were used string together as if by magic to tell the tragic tale of the slaying. Murder of Crows is a fast-paced, darkly witty game for two to five players. It’s the perfect game for a quick bout over lunch, or a series of rematches in the course of an evening. It’s easy to teach and easy to learn, but don’t be fooled — it also delivers plenty of fun and myriad strategic challenges. 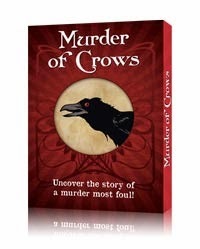 The first printing of Murder of Crows disappeared fast. Don’t miss out on this second chance to grab the perfect blend of wickedness, humor, fun, and homicide.